Chris Eames moves the people who move the people. Getting your show on the road - safely, professionally, on time. That’s Chris Eames’s business and your success. From major motor shows, boat shows and product launches to book fairs and trade and public exhibitions, Chris Eames International’s reach extends to wherever you need it, opening. We coordinate logistics for every project with our local teams around the world – and with an experienced eye for the details that make the difference. From static events to putting your show on the road - whether you need to ship a stand to Frankfurt, or priceless works of art to Paris, New York and Tokyo - you can trust CEI every step of the way. Whether on location or for outdoor events, when you need to put your show on the road our 7m mobile, slide-out unit creates a versatile space. Wired for 240V and with a fully glazed front, the unit is suitable for a variety of functions, from green room, production office or additional exhibition space, to a small stage, DJ booth or mobile hospitality or marketing suite. Please see Trucks and Dimensions for specifications on every vehicle and unit in our fleet. 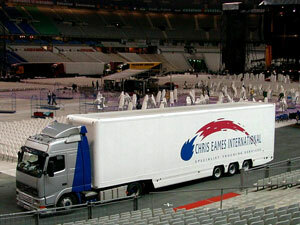 Chris Eames International services tours, exhibitions and events around the world – supporting our road transport operations with a comprehensive, cost-effective range of air, sea and surface freight packages. Our experienced team manages all the necessary paperwork for you – including customs documentation, clearances and ATA carnets – with the support of on-the-ground knowledge and local contacts at the receiving end, to make sure everything you need arrives safely. Right place. Right time. Contact us with your requirements for a competitive, no-obligation quote.